It’s the perfect appetizer to make for your guests on any occasion; even give this recipe a try in a pinch. It’s the antipasto that could also make just the perfect light lunch. 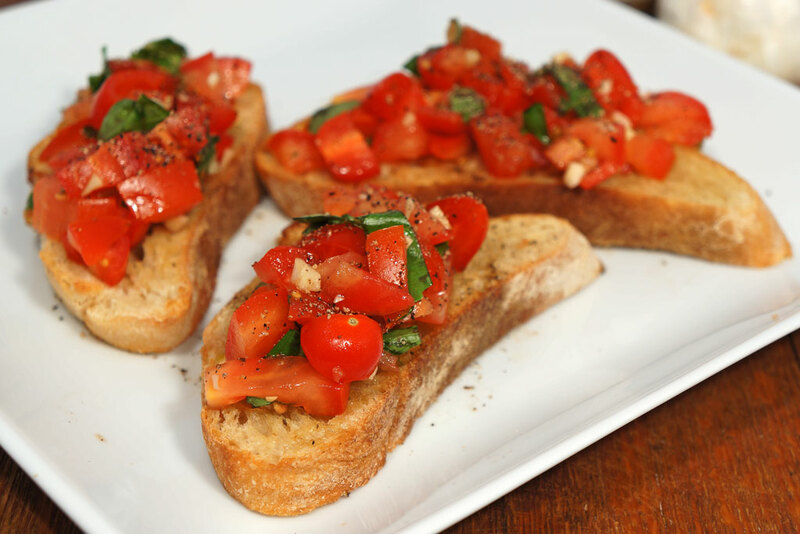 Bruschetta is an Italian favorite that’s sure to satisfy your taste buds. 2 large (or 1 -2 cups) tomatoes cut into bite sized pieces. Experiment with large, Heirloom, Roma, Grape tomato varieties to add color and flavor. 1 loaf of The Essential Baking Company Bake-At-Home Sourdough, or other Essential Baking loaf, cut into 1/2 – 1 inch thick pieces. In a bowl, toss together tomatoes, basil, olive oil, balsamic vinegar, and salt. Cut bread into 1/2 – 1 inch thick pieces. Brush some extra virgin olive oil on one side of each slice of bread. Put sliced bread on a baking sheet or directly on your oven rack and broil, turning bread once for a total of about 2-3 minutes or just until bread is lightly toasted. Remove bread from oven and place bread on a serving platter and spoon tomato, basil, and garlic mixture carefully onto each slice.